During my day if you wanted to get a woman in that special place where you could love her something good all you had to do was turn on some soothing slow jams. During the 90's there were an abundance of R&B artists who could do that trick. Many of them were one hit wonders and a lot of them were holdovers from the 80's that were still carving out their sound in the music world. But just like any change of the guard in regards to anything that is going a significant change, you have those that manage to push through and make their way to the top. One of those people just happened to be Maxwell. Starting his career in the early 90's, he spent between 1994 and 1995 recording his debut album Maxwell's Urban Hang Suite. Not released until 1996, the album went on to become 2x platinum and one of the standout albums on the 90's. He went on to coin another platinum album in the form of Embrya; but it was following album Now that earned him universal acclaim on the commercial market. Now contained, (to me), two all time classic songs: Lifetime and This Woman's Work. It's with these two songs that I began appreciating Maxwell; (and the fact that I was starting high school then and a lot of things began to make sense music wise). Plus there wasn't a day that the radio didn't play these songs when they each debuted. Not to mention that the latter was involved in perhaps one of the greatest black love scenes ever. While both of those songs are definitely the pinnacle of his career he still found major success with his latest album BLACKsummers'night. Since I was old enough to know any better this is definitely my favorite album from him. This album came at a time when I was looking for R&B music that I could personally relate to. In fact it's 2016 and I'm still listening to songs off of this CD, that says a lot. Maxwell is one of those artist that I've come to appreciate more and more as I've gotten older. It's only because that I've actually went though some life experiences that made me understand his content and the tone of his songs. Hopefully he'll give us one last great album before he enjoys his rightfully deserved life of chill. 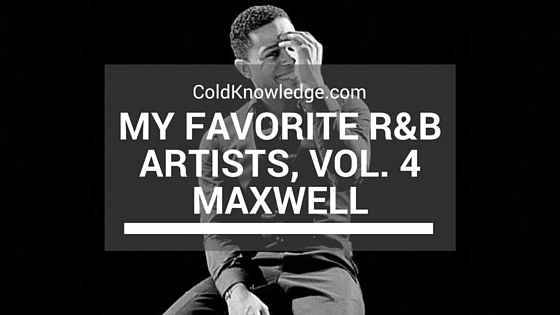 But for those looking for R&B that speaks to your heart, mind and soul, then Maxwell is your man. He definitely helped me out in some of those times where you just wanted to be alone.